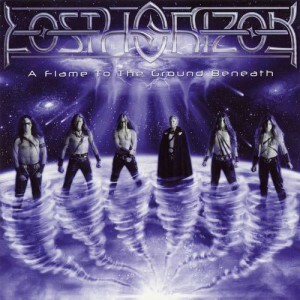 A Flame to the Ground Beneath is the second and final album by Swedish metal outfit Lost Horizon. It is a direct continuation of the distinctively uplifting power metal/progressive metal sound that they developed on their first album, Awaken the World. The songs are longer than before and in keeping with the tradition of progressive music, they contain many verses that can flow easily from one to the next without necessarily having the need for a chorus. The saving grace Lost Horizon balances this out with is never getting wrapped up in taking their songs in a thousand and one directions while maintaining their triumphant sound and positive message about self-empowerment and free will over fate in their lyrics. Sadly, Lost Horizon still insists on including their ambient interludes which fail to leave a lasting impression. The introduction song, Transdimensional Revelation, is slow on the uptake and doesn’t give any indication as to what A Flame to the Ground Beneath is all about. However it does serve as an excellent buffer to the first metal song, Pure, and gives it a bigger impact when it kicks in seemingly out of nowhere (although it should be noted that like the other songs, it can speak for itself). The odd coupling of ambient interludes and heavy metal is by no means a bad concept but the execution is definitely in need of refinement. Both the bass and keyboard playing can be heard clearly enough but the bass still finds itself competing with the guitars and drums like it does in many other metal bands. The keyboard tends to find itself in a supporting role but has a few moments to bolster some songs such as Lost in the Depths of Me and Again the Fire Will Burn. It is also the only instrument on the mid-album interlude The Song of Earth, which pleasantly enough turns out to be a full song rather than misguided soundscaping. Much like Awaken the World, A Flame to the Ground Beneath is sung entirely in English and not being the bands native language, there are some mishaps with the lyrics that don’t flow exactly as they should do. On most occasions Daniel Heiman’s vocal range alone will distract you from this and more than makes up for it. One of the major highlights of A Flame to the Ground Beneath is Highlander (The One), a 12 minute epic that features some of Daniel Heiman’s most extravagant moments and with all the wailing he does, it would make you think that the entire song was written for him to push his voice to the limit. The last minute of the song is by far one of the best metal moments committed to a recording. Unfortunately A Flame to the Ground Beneath ends with the interlude Deliverance. This deals a significant blow to the flow of the album as it should have ended on Highlander (The One) to give you the massive triumphant feeling that Lost Horizon is all about. The songs (that go from 6 to 12 minutes) might sound daunting on first impressions but Lost Horizon have the musical chops to back up their ambitious goals and present another significant entry into the power metal/progressive metal catalogue with A Flame to the Ground Beneath. Another great review keep up the great work!